It’s 3:00 AM on a Saturday night in a bodega in Harlem and the line for the deli is steadily growing with hungry patrons stumbling in from a long night of partying. Though the patron’s orders tend to vary from cold cut sandwiches to bacon, egg, and cheese sandwiches, one sandwich seems to be ordered with more frequency than others: the chopped cheese. 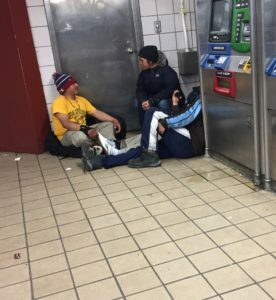 Juan Venero, a Bronx native, and his friends were next in line. “Let me get a chopped cheese with everything on it,” Venero said, as his friend echoes the same order to the man behind the deli. Chopped cheeses are considered a staple in authentic New York’s inner-city gourmet. With a simple recipe of ground beef, lettuce, tomatoes, ketchup and melted cheese on a hero bread, chopped cheeses have been devoured by New Yorkers for decades. “It’s like if you go to France you get croissants, or if you go to Italy, you get pasta or spaghetti”, Venero said, as he started to bite into his freshly made chopped cheese. “When you’re in New York, you get a chopped cheese or a slice of pizza,” he said. 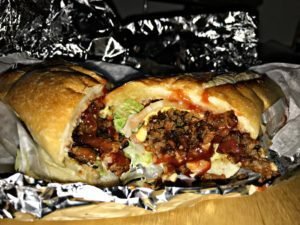 Though the chopped cheese sandwich is a popular delight for many New Yorkers who lived or worked in the Bronx and Harlem, very few seem to know where the sandwich originated from. Even Rob Williams and Jasmine Leon, both Harlem residents for most of their lives, did not know where the famed sandwiched was birthed. “I actually have no idea. I guess I never really thought about where it came from, but I do know I want one now,” Leon said as she waited for a bacon, egg and cheese sandwich in an East Harlem deli. According to an article in The New York Times, the chopped cheese sandwich is said to have been made by Carlos Soto in an East Harlem bodega 20 years ago. Though a popular narrative, the sandwich’s origin cannot be fully proven. Chopped cheese fans believe that the mystery behind the sandwich is what causes it to be more appealing. “Let’s keep our mouths shut, our eyes closed, and enjoy it and eat it,” popular rapper Bodega Bamz said when talking with the food channel “First We Feast” about the mystery of the cult-classic sandwich. Even Al, who makes the sandwich daily, knows very little about the sandwich but is eager to learn as much as possible. “When I started working here a few years back, I was like ‘What the hell is a chopped cheese?’ I’m from Jersey, but my boss said I’d be making a lot of those, so I learned pretty quickly,” said Al, once the customers had dispersed. Al makes up to 10 to 15 chopped cheese’s daily and he works the afternoon shift, but on the weekends that number tends to increase. “It’s like we’re their last option you know, everyone coming home late and they’re hungry, what else is open,” said Al, as he watched his happy customers gather around to eat their sandwiches. Chopped cheeses can now be found all throughout local bodegas in NYC, but some say the only place to get a real chopped cheese is Harlem and the Bronx. “They’ll charge like $20 for a $5 sandwich, get outta here with that,” he said. As inner-city residents rave about the cheap yet flavorful sandwich, some people do not see what the buzz is about. “I recently turned vegan so I don’t eat meat in general, but when I was younger I tried it once and didn’t really care for it, it was okay,” said Meghan, an East-Harlem resident. Other residents feel that the sandwich’s concept doesn’t make much sense at all. “I’d rather just get a burger, why would I want a burger chopped up for me, I can chew by myself,” said Eli Davidson, longtime Harlem resident. William Wilson, a Harlem native, recalls his experience with chopped cheeses. “I’ve been eating chopped cheese since I was in the sixth grade, and I’ll have one every now and then just to feel some nostalgia about the good old days,” he said. Despite the different opinions on the cult classic sandwich, it’s safe to say that chopped cheeses are here to stay. The sandwich is ingrained in New York City’s culture, and more importantly, New Yorkers themselves.